Undefeated super middleweight Ronald “Flatline” Ellis returns from a tenth month hiatus when he takes on perennial spoiler Taneal Goyco this Saturday night at The Silver Eagle Gun Arena in Ashburn, Virginia. Ellis (14-0-1, 10 KOs) will be making his ring return following surgery for an injured hand. He injured the hand in his January 20th bout with Christopher Brooker. That bout was televised on ShoBox: The New Generation. “I had the surgery in April. I took my time and had a good camp, and now I am ready to go on Saturday,” said Ellis. In Goyco, he has facing a tough opponent who has already notched upset wins over Frankie Filippone (14-2-1), Jeremy Trussell (8-0), Dennis Hasson (16-1), Devin Butcher (5-0) and former Ellis foe Jerry Odom (14-2-1). To say that Goyco has a deceiving record at 9-10-1 is a huge understatement. Ellis believes that with a win on Saturday, he is set up for a big 2018. 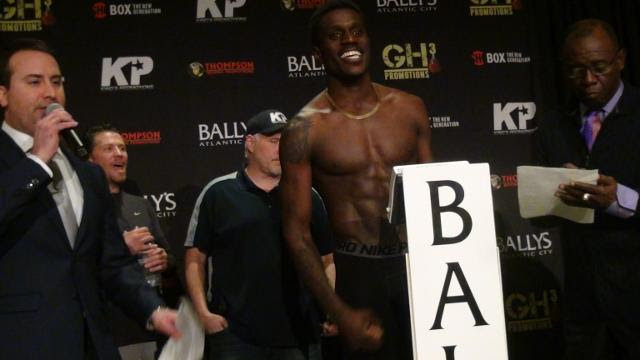 Ellis is promoted by GH3 Promotions, and CEO Vito Mielnicki is echoing the thoughts of his prized super middleweight.